On 21 September 2017, the Supreme Leader of the Iranian Islamic Revolution, spoke to the head and the members of the Assembly of Experts with kind of a State of the Nation Speech. He addressed many issues from internal affairs, competing factions within the Islamic Revolution, to external relations – and the economy. He also referred to The Joint Comprehensive Plan of Action (JCPOA), commonly called the Iran Nuclear Deal, the international agreement on Iran’s nuclear program, reached in Vienna, Austria, on 14 July 2015. The accord is barely two and half years old and already breached by one of the five main-sponsors, the United States of America. The agreement also refers to the P5+1, meaning the five permanent members of the United Nations Security Council (UNSC) – China, France, Russia, United Kingdom, United States – plus Germany and, of course Iran. The European Union was also part of the agreement in an observer function. “The problem that I had and continue to have with the nuclear negotiations – I have discussed this matter in private and in public with officials – is this: what I am saying is that it was alright to negotiate, there was nothing wrong with negotiating, but those negotiations should have been conducted with care and precision so much so that every short move by us will not be considered as the violation of the Bar-Jaam [the JCPOA], while this is not the case for every wrong move that the other side makes! This is wrong! This should not happen. This happens due to lack of trust in and attention to domestic power. This state of affairs happens due to reliance on the other side and on foreign elements. The Supreme Leader clearly refers to the non-trustworthiness of the US of A and her vassal allies, i.e. the European Union and her member countries, foremost, Germany, France and the UK. And he is of course right. Western ‘partners’ are almost unilaterally not reliable. Washington, especially Trump and his generals, directed by their Deep State handlers, the most prominent of whom is Netanyahu, the Zionist-in-chief and close buddy of the Donald, actually so close that he and his cronies decide on US foreign policy, i.e. that Iran is a terror state and has to be ‘neutralized’. This means the nuclear deal negotiated under Obama should be declared nil. Trump has been doing this ever since he ascended to the throne, and even before, during his campaign. Without the Zionists money (i.e. Wall Street), it may have been difficult for Trump’s dark handlers to catapult him into the Oval Office. In his Tweet-manners, Trump issues threats after absurd threats to Iran, all baseless and outright lies. Wake up, world, for those who still read and believe in Trumps unfounded accusations, be it on Iran, North Korea, Syria or Venezuela – and in fact many more – tweet back, asking warrior Donald to stop his aggressions and seek peace instead. If We, the People, the 99.9%, send him this massive message, he may reconsider sending his “fury and fire” message around the globe, boasting of having his finger on the red nuclear trigger bottom. In reality, he doesn’t want to see himself and his multi-billion fortunes going up in flames. Yet, calling these threats ‘kindergarten speek’ would be dangerous, because this madman, much-much madder than the “Rocketman”, is totally unpredictable. Just listen to his speech at the UN’s General Assembly of last September and to the senseless utterings of his incompetent UN-delegate, Nikki Haley. Iran knows it. Hence, the Ayatollah’s call for caution, not just for Iran, but for the rest of the world, should be taken seriously. Another important point the Ayatollah makes in his address to the Assembly of Experts is on Iran’s economy. “The issue of paying attention to reliance on domestic hands for the sake of solving the problems of the country should turn into a well-established idea in the people’s minds. This should be repeated, explained and clarified so many times until it turns into a definite discourse. We have motivated youth and skilled individuals. We have good producers, good entrepreneurs, good laborers, good farmers, good teachers and good professors. Tasks should be improved by such individuals. It is these individuals who should eliminate the problems of the country. It is also they who should solve economic problems and various other problems related to business. This is a clear reference to an “Economy of Resistance” which Iran has embarked on during the past couple of years, including the principles of import substitution, local investments with local money, local research and development, trading with friends and neighbors, and – especially decoupling from the western dollar-economy which will also be a protection from US imposed sanctions. For once, the EU and especially the EU leaders, Germany, France and the UK, did not heed Trump’s call for continued sanctions on Iran. Instead, especially France and Germany signed bilateral trade and technology exchange agreements with Iran in the billions of euros. But make no mistake, they wouldn’t have signed them, if they weren’t on the winning side of the deals. That’s predatory capitalism at its worst. That’s what the west knows best. The only good thing for Iran about these agreements is that they cement the nuclear deal. Money – billions of dollars – is stronger for the neoliberal capitalists than Trump’s toothless threats. However, these deals with the west bear the danger and risks associated with further exposure to the western monetary system, further vulnerability to western threats and sanctions, as all international transactions in western currencies have to transit the US banking system – and can be stopped by a US judge, practically at will. Argentina is a case in point, when in 2014 US District judge, Thomas Griesa in Manhattan, stopped an Argentinian payment to creditors of US$ 500 million, blackmailing Buenos Aires into paying an illegal debt of US$ 1.6 billion to Paul Singer’s predatory Elliott hedge fund. – Iran beware of such risks! Sanctions of the past, nonetheless have left a dent in Iran’s economy. 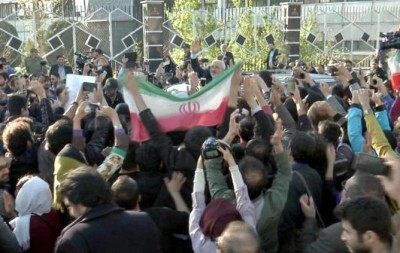 They contributed to inflation and to shortages of mostly foreign goods – which in turn, combined with unemployment, may have been the main reason for last week’s non-violent protests that started on 28 December in Iran’s second largest city Mashhad. They then spread across the country and, inspired by outside forces, became violent, claiming the lives of at least 21 people. They are the most violent protests since those following the 2009 elections, disputing the victory of President Mahmoud Ahmadinejad. They were then said to be officially inspired by opposition candidates Mir-Hossein Mousavi and Mehdi Karroubi, but, in fact, they were largely influenced and promoted by Washington’s secret services. 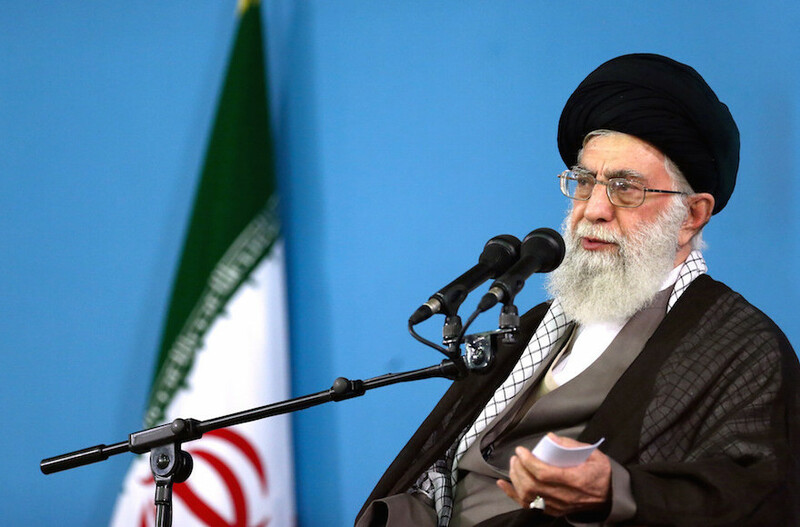 Ayatollah Ali Khamenei on 1 January, according to Reuters, blamed Iran’s foes for fomenting the unrest. Though he didn’t specify who they were, the secretary of Iran’s National Security Council, Ali Shamkhani, said the United States, Britain and Saudi Arabia were behind the riots. He could have added Israel. There is no doubt, he is right on the dot. The insurrections appear like well-orchestrated western Color Revolutions, or Arab Spring type upheavals, aiming at Regime Change – what else? Similar cases abound throughout the Middle East and the rest of the world. It is true that neoliberal factions in Iran – the fifth column – is an instrument of the west, a driving force to keep Iran within the orbit of western influence and especially the western monetary system. Iran’s leadership better be aware – this can be fatal. It will likely bring more economic strangulations as similar dependencies have brought to other nations that wanted to preserve their sovereignty instead of bending to the empire. People living under economic hardship can easily be manipulated and mobilized to raise against their government. Iran has to walk a fine line. The Resistance Economy may require some initial sacrifices and may take time to take hold. But eventually it will. Russia has applied it fully, after the ‘western sanctions’. President Putin has repeatedly said that these sanctions where the best thing that could have happened to Russia since the fall of the Soviet Union, because they have prompted Russia to revive its agricultural sector, as well as industry and scientific research. He even said so to the Ayatollah during his last November visit to Iran, suggesting that de-dollarization of Iran’s economy might be a good thing. Indeed, after Russia went through a couple of economically hard years, she is now on an ascending curve. This is witnessed by two years in a row as the world’s largest grain exporter – a renewed, modernized industrial park, largely replacing what Ukraine produced for Russia in the past, increased trade with the Central Asian former Soviet Republics – and especially, an economy almost completely decoupled from the dollar, working with China and the rest of the SCO on an own currency and trade exchange system, i.e. the petro-yuan, convertible in gold. Iran could do the same, without bending over to France and Germany (and others in the corrupt EU) for billion dollar / euro trade and technology deals. France is not trustworthy, neither is Germany, they are just out there to take advantage – see Germany’s strangulation of Greece. They are vassals in Washington’s pockets. Their ‘leaders’ were put in place by Washington’s propaganda, Wall Street money and election manipulations. Continue pursuing the path of “Resistance Economy”, concentrating on “local production for local markets, with local currency and through local state-owned or public banking for the benefit of the national economy”. This is one of the principles of “Economy of Resistance”. – It includes ‘import substitution’ at a large scale, including using Iran’s own science, i.e. ‘research and development’ (R&D) capacity. Refrain to the extent possible from seeking trading / business / banking relations with the west – and stay away from the IMF and the World Bank. Instead focus on the east, on the Shanghai Cooperation Organization (SCO) and on some of the BRICS countries for external business and trade, and on the Asian Infrastructure and Investment Bank (AIIB) for development assistance. The future is definitely in the East, and as a member of the SCO, Iran is already part of the East – China’s One Belt Initiative (OBI) includes Iran – it is a multi-trillion-dollar (equivalent) program that will dominate economics in the coming centuries. Use your own money, not western currencies, especially not the US dollar or its off-spring, the euro. Follow the de-dollarization example of Russia and China, if need be, develop a national cryptocurrency, controlled by the government for external trade, to circumvent western sanctions – see Venezuela. Finally, be always aware that Washington, masterminded by “the Deep Zion-State” – will never let go. This doctrine is engraved in the PNAC (Plan for a New American Century), largely conceived by Washington’s Zionist think-tanks. Once they decided on a target, like the Ayatollah so eloquently says, i.e. Iran, Syria, Lebanon — and in Asia, North Korea and China, they will not let go. No matter whether there is a peace agreement, or whether they have made a promise, – nothing, but nothing that Washington says, signs and promises can be trusted. – The war in Syrian, for example is not ”over’’ as Mr. Putin has made believe, when he said Russia will pull out their troops. Just look at the US military base at Al-Tanf in Syria – a US base established fully illegally in Syria. The US was never invited to set foot in Syria. Yet, they not only are enhancing their base, they are also training new Daesh / ISIS terror groups to fight Damascus. Iran will prevail. Iran is not alone. Iran has a mighty eastern alliance, including Russia and China. Trump and his handlers know it.